Everton and Umbro have revealed the Club’s third kit for the 2015/16 season with the help of a Marvel illustrator. 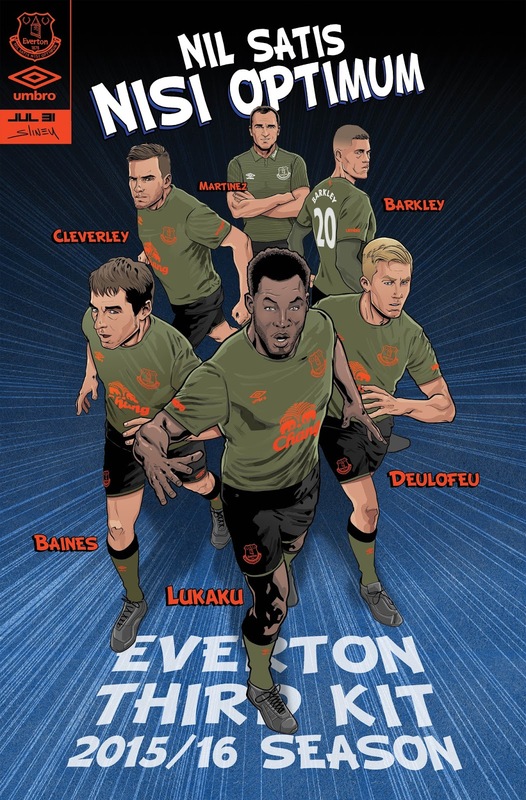 Umbro and the Blues have commissioned artist and Evertonian Will Sliney to create comic book drawings of the players wearing the new third kit, which will see the team sport a green outfield strip for the first time in the Club’s history. The kit comprises of a green crew-neck shirt with the club crest and Chang logo in a contrasting, striking orange, with black shorts and green socks. Will has created a bespoke piece of art to showcase the strip featuring Ross Barkley, Leighton Baines, Tom Cleverley, Gerard Deulofeu, Romelu Lukaku and Blues’ boss Roberto Martinez. The third strip will be worn for the first time on Saturday August 15 when Everton face Southampton at St Mary’s in the Barclays Premier League. The lightweight third shirt features shaped mesh underarm panels for optimum fit, movement and comfort. And the crew neck rib collar offers a contemporary look and the textured appliqué club crest and Umbro double diamond completes the smart appearance of the shirt. The reverse of the third shirt, like the home and away, carries an 'NSNO' insignia on the back neck area, a reference to the Club’s famous ‘Nil Satis Nisi Optimum’ motto. The 2015/16 third kit goes on sale on Wednesday August 26, both in-store and online and is available for men, women, juniors, infants and babies. To pre-order the 2015/16 Everton third kit, visit www.evertondirect.com from 08.00 on Monday August 3 or Everton One or Everton Two during store opening hours. This season, Everton and retail partner Kitbag have rolled out a new Click and Collect service that offers a more convenient collection method for supporters who order merchandise online. As well as still being able to collect their purchases from either of the two Everton stores, supporters are now able to pick up their parcels from any of the 5,000 Hermes Click and Collection partner sites throughout the UK. For more information about the Click and Collect service, visit www.evertondirect.com.